This is literally the first opportunity I have had to answer your letter of December sixth. I think that you yourself suggest just the sentence to add to my Staunton letter now, as follows: “Before the experiments in Oregon, there had been no American facts to floor me with. I had been going altogether upon my theoretical conclusions as to how far the facts in Switzerland would fit conditions in the United States.” I think that will, by implication at any rate, set the matter through my former opinion in its proper light. I have an inveterate disinclination to explain things away. I appreciate more than I can say all that you are doing and send this note as a hasty message of thanks. 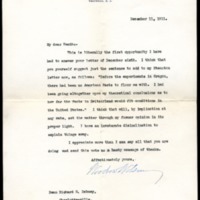 Wilson, Woodrow, 1856-1924, “Woodrow Wilson to Richard Heath Dabney,” 1911 December 11, WWP20455, University of Virginia Woodrow Wilson Letters, Woodrow Wilson Presidential Library & Museum, Staunton, Virginia.